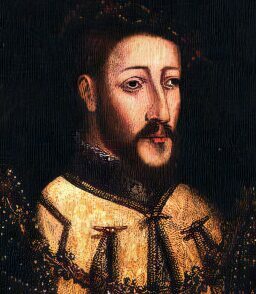 James V was the only surviving son of James IV and Margaret Tudor and was born on or around 10th April, 1512 at the Palace of Linlithgow in West Lothian. He became King in 1513 at 17 months old on the death of his father in battle against the English at the Battle of Flodden, one of the greatest defeats ever to be suffered by the Scots. James was crowned at the Chapel Royal at Stirling Castle on 21st September, 1513 . Scotland was ruled by regents for the next 15 years. It seemed the inescapable fate of the Scottish nation to suffer long minority governments. James avaricious mother, Queen Margaret Tudor, who was the sister of the formidable Henry VIII of England, was appointed tutrix or governor of the young king in accordance with the terms of her late husband's will. She naturally favoured alliance with the English, which did little to improve her popularity in Scotland. The Queen bore the posthumous son of James IV, christened Alexander, although unfortunately the child did not survive long. The Dowager Queen hastily remarried to the powerful Archibald Douglas, Earl of Angus. The marriage did not increase her standing with the power hungry Scottish nobility. The couple produced one child, Lady Margaret Douglas, who was married to Matthew Stewart, Earl of Lennox, she was to become the mother of Lord Darnley, who entered into what was to prove a disastrous marriage to his first cousin, James daughter, Mary, Queen of Scots. The minority of James V witnessed the now familiar and weary pattern in Scotland of a developing power struggle amongst the nobles. There were both pro-English and pro-French factions. At the request of those who favoured an alliance with Scotland's traditional ally, John Stuart, Duke of Albany, his nearest male relative, was recalled from France in 1515 to rule as regent. He promptly expelled Margaret and her faction, who took refuge with her brother in England. Albany was to rule Scotland for ten years and showed himself to be a competent and responsible administrator. While the Regent was conducting business in France in 1525, the Queen's husband pulled off a coup d'etat which gave him complete control over the now thirteen year old King. In the following year James became officially of age to rule, but all actual power rested in the hands of Angus, who was now divorced from Queen Margaret. In the summer of 1528, James escaped from the unwelcome clutches of his step-father on the pretext of going hunting and over the next few months asserted his own power and drove him out of Scotland. Angus found refuge at the court of James' rapacious uncle Henry VIII, to whom he complained bitterly about the behaviour of his wife and ingracious step-son. Henry gravely professed himself scandalized by his sister Margaret's behaviour in divorcing her husband, mirroring as it did his own. James V had grown into a handsome and charismatic young man with auburn hair, heavy lidded eyes, which were an inheritance from his Tudor mother and strong aquiline features. His health was never robust. He had a genuine concern for the welfare of his subjects and consequently became much loved by them. 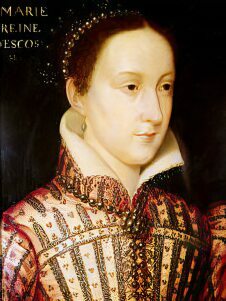 James sometimes displayed a highly emotional streak to his nature, along with a nervous disposition, which he was to pass on to his ill fated and tragic daughter Mary, Queen of Scots. In the face of his uncle Henry VIII's hostility to Scotland, the King attempted to strengthen the 'auld alliance' with France. Negotiations began with the French for the hand of Madeleine of Valois, the daughter of Francis II of France, who provided her with a substantial dowry. Francis held reservations about sending his very delicate daughter to Scotland, fearing that the harsh Scottish climate would undermine her precarious health and such proved to be the case. The sixteen year old Queen of Scotland died within two months of arriving in her new country. 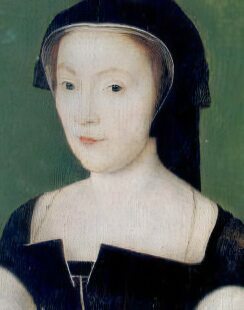 James renewed his matrimonial negotiations with the French, his attention was this time focused on Mary of Guise, a tall and strongly built widow, who unlike his first choice, enjoyed robust health. Marie was the eldest daughter of Claude, Duke of Guise and Antoinette of Bourbon. Henry VIII had been his nephew's rival for the hand of the lady. 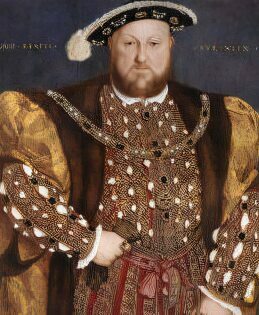 After the death of his third Queen, Jane Seymour, Henry had begun to make overtures to the French, quoting that he was large in person and had need of a large wife. Apparently, Marie was not over eager to enter into the match and when Henry remarked on her fine stature she retorted with the witty repartee that although her body was big, she had a very small neck. She consented instead to marry James. James and Marie quickly produced two sons, James and Robert. The stage seemed set for domestic bliss when the hand of tragedy struck. Prince Robert survived but two days and was quickly followed to the grave by his elder brother James, the heir to the throne, at but eleven months old. Rumours of poison circulated at the time but it is more likely that the babies were simply two more victims of the appalling infant mortality rate of the times. Henry intended to teach his ungracious Scottish nephew a lesson, English forces were mobilized and marched north. They were temporarily held back at Haddonrig, when James' forces won a victory over the English invaders. On 2nd October the Scottish ambassadors ruled out a conciliatory meeting between James and Henry VIII in England until the pregnant Mary of Guise delivered her child. James sent a further army to meet the menacing English advance, command of which was given to the King's great favourite, Oliver Sinclair. The two armies met at Solway Moss on the 24th November, 1542, the Scots experienced a crushing defeat, with many of the nobles taken prisoner. James took the affair very badly. His emotional nature lead him into deep depression over the event with an over-riding sense of defeat and humiliation, made worse by constant worry about the fate of Sinclair, who was reported to have fled. The King, who did not take part in the battle as he was ill with a fever, retired to his palace of Linlithgow, in a continued state of great mental anguish. He then moved onto Falkland. Here he received the news that his pregnant Queen had been delivered not of the much hoped for son and heir to Scotland, but a daughter, christened Mary. James, now totally crushed and in a state of severe anxiety and foreboding lamented piteously "Adieu, farewell, it came with a lass and will pass with a lass", referring to his dynasty's position on Scotland's throne being established by Marjorie Bruce's marriage to his ancestor Walter Stewart. Six days later, on 14th December, 1542 the King died. He was but thirty years old. James was buried at Holyrood Abbey beside his two young sons and his first wife, Madeleine of Valois. He was succeeded by his infant daughter, Mary, Queen of Scots. (1) Adam Stewart (d. 20 June 1575), son of Lady Elizabeth Stewart (daughter of John Stewart, 3rd Earl of Lennox.) Prior of Charterhouse, Perth. (2) James Stewart, son of Christine Barclay. (4) James Stewart (c. 1529-57), son of Elizabeth Shaw. Commendator of Kelso and Melrose. (5) Robert Stewart, 1st Earl of Orkney (b.1533), son of Euphame Elphinstone, Prior and Commendator of Holyrood Abbey. 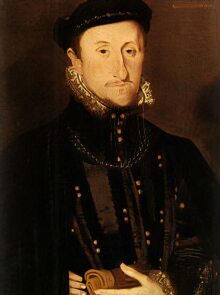 (6) John Stewart, Lord Darnley and Prior of Coldingham (c. 1531 - November 1563), son of Elizabeth Carmichael (1514-1550) married Jean Hepburn, sister and heiress of James Hepburn, 4th Earl of Bothwell, their son Francis Stewart became Earl of Bothwell. (8) Robert Stewart (d. 1581), mother unknown, Prior of Whithorn. (9) Margaret Stewart, mother unknown.